For more details on this product, view the brochure. Includes: Diagnostic spirometer, USB cradle, color inkjet printer, EasyWare software (3 year warranty). — Shipping Not Included. 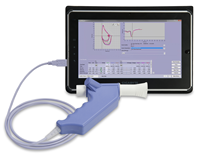 Includes: Diagnostic spirometer, USB cradle, EasyWare software DOES NOT INCLUDE PRINTER. (3 year warranty). — Shipping not included. 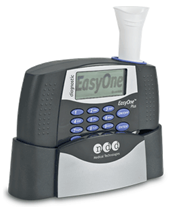 Includes: Spirometry sensor, software and carry case (3 year warranty). — Shipping Not Included. 2700-3k – Easy on-PC Spirometry Kit Includes: 2700-3 Easy on-PC spirometry system, (2) cases of 50 spirettes, (2) bags of 25 nose clips, 3-Liter calibration syringe with adapter, 2 year extended warranty (5 year total warranty). — Shipping not included. 2050-1 – Spirettes, case of 50.